The World Until Yesterday is Jared Diamond’s latest book, following Guns, Germs and Steel, Collapse and The Third Chimpanzee. It is the most personal of his works so far. Its emphasis is on the human family and what it can learn from traditional societies. 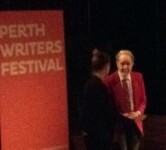 While in Australia, Diamond spoke at the Perth Writers’ Festival about The World Until Yesterday. He started by asking who was above or intended to live past 65. It was a light-hearted introduction to the serious subject of ageing. In The World Until Yesterday he poses the question; what can traditional societies teach us about the role of elders? Diamond recognised a range of methods used in these societies to discard the ageing. These ranged from deliberate neglect to assisted suicide and outright homicide. His is no idealistic, rosy eyed view of noble savages. It was a glimpse of a man reflecting on his own mortality, referencing the unique wisdom of elders in pre-literate cultures, then deftly picking through impromptu questions from the audience – a virtuoso performance. Diamond’s Guns, Germs and Steel has been criticised as a superficial, deterministic interpretation of human history. That narrow view might be attractive to specialists in natural sciences who lack exposure to real world issues. But the compelling argument in Guns, Germs and Steel emerged from decades of painstaking fieldwork among traditional societies, particularly in Papua New Guinea. Diamond follows an honourable tradition of anthropological fieldwork in this region, starting with Alfred Russell Wallace and continued into the post-colonial era. The World Until Yesterday has opened a further round of controversy. Academic social anthropology is a good place to find a source of critical but generally balanced opinion about the book. Listening to Diamond, I was struck by the similarities between him and Leonard Cohen who performed in Perth recently. Both in their seventies, Cohen has mellowed with age. His original harshness has softened, but he remains an acute observer of the human condition. So it is with Jared Diamond; an observer and story teller at the peak of his game. As he pointed out during the talk; analysing complex DNA sequences and operating TV remote controls require a younger and more agile mind. But an enduring capacity for analysis of complex multidisciplinary datasets explain why social anthropologists can continue into their later years. The World Until Yesterday shows us that for Jared Diamond at least, we should expect a world after tomorrow. For students of The Language of Infection, chapter 10 (Speaking in many tongues) is particularly encouraging. But do not miss chapter 8 (Lions and other dangers). This brings up to date Diamond’s perspective on infectious diseases in traditional and urbanised societies. Once again, the chapter is written in a very personal style. Having seen a little of contemporary life in Papua New Guinea, The World Until Yesterday is an insight into what we can learn from a people who next door but who are so different in many ways. Thanks for the book review. I’ve got it on the same day at the Writers’ Festival a bit earlier than the evening talk following an early afternoon conversation between Jared Diamond and historian Tom Holland: “A window into our past”. It was very relaxed and very informative. I liked the easy flow of information, sense of humour and lots of parallels between ancient societies of our past such as Ancient Greece, Rome, Persia (Tom Holland) and modern traditional society of PNG (Jared Diamond). At one stage during the conversation, Jared Diamond referred to PNG as a ‘transitional’ rather than traditional society due to a fact that PNG has been exposed to our modern western-style society for a period of time now. So, it is an interaction in which both sides can learn from each other (not the methods used to discard the ageing, thou).